I mentioned on Monday that I’m trying to learn more about Chinese cooking and gain some confidence in that culinary arena. I’ve been reading The Key to Chinese Cooking , and this is another dish from that book. Pocket eggs were very simple but new to me. 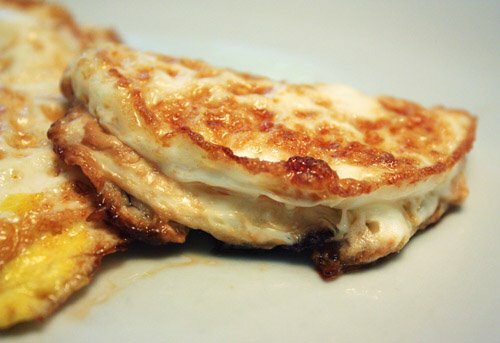 The basic concept is to break eggs into a pan to fry them and fold them in half before they are finished cooking. Easy enough. Soy sauce, cider vinegar, and sugar were combined as a sauce which was poured over the eggs at the end of the cooking time. As I turned the eggs onto themselves, I imagined future versions of them as mini egg tacos stuffed with a pinch of shredded cheese or a dab of salsa. The resulting half-moon eggs were very cute especially when you think of them as mini egg tacos. For a moment, I considered leaving the sugar out of the sauce which is just the sort of thing I would normally do. But, since I’ve been on a mission to learn from Irene Kuo and gain some understanding of Chinese cuisine, I stuck to the exact instructions. The sugar mitigated the vinegar’s acidity and was balanced by the soy sauce. The sauce is poured into the hot pan just as the eggs have finished cooking, the heat is turned off, and a lid is placed on the pan. You shake the pan as it sizzles, and the sauce thickens just a bit as it swirls around the eggs. The process was so simple I really couldn’t have failed. I need to learn a few more dishes to create a complete Chinese brunch, but the pocket eggs were a success. I have to come clean about a major deficiency in my culinary skills. Actually, there are several, but the one I’d like to mention today is my complete inability to prepare Chinese food of any kind. This disability is made clear by the look of horror and queasiness on Kurt’s face when I mention a plan to cook something Chinese. Sure, recipes fail sometimes. It could be the ingredients, the cooking time, or even the weather. I’m not talking about minor failures here though. The ugly fact is that I have turned out some truly horrible and inedible Chinese dishes. And, really, it’s not just Chinese food. I’m blocked when it comes to cooking any Asian cuisine including Indian. I decided it’s high time to do something about this. I need to try a little harder, read something authoritative for inspiration, and acquire some Asian cooking self esteem. I turned to The Key to Chinese Cooking by Irene Kuo which was published in 1977. I’ve just started reading this informative and valuable reference, and I attempted two dishes from the book on Sunday. I’m happy to report both were successfully prepared and quite edible. I could be making progress. For the shrimp with broccoli, I learned about the velveting process. This is a pre-cooking step which gives pieces of meat a protective coating so they retain a very tender texture. This technique is common in southern Chinese cooking but is not used in the north. Pieces of meat are stirred into a marinade of oil, egg white, and cornstarch, and then they rest in the refrigerator for 30 minutes. The pre-cooking can be done in oil or water, and I chose water. 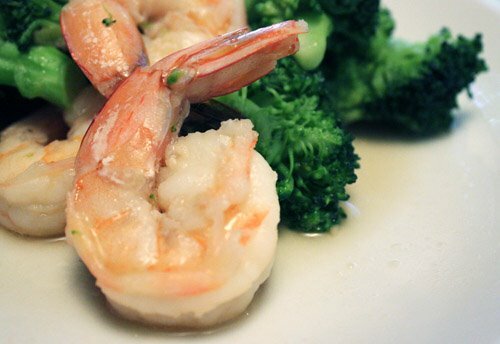 A pot of water is brought to a boil, a tablespoon of oil is added, and then the coated shrimp are added while stirring. You continue stirring while cooking to keep the shrimp separated. Once they turn opaque, the shrimp are removed and drained. They should be used right away and not returned to the refrigerator. To complete the dish, ginger slices and smashed garlic are stir fried in oil in a hot wok. Blanched broccoli flowerets are added and cooked while being quickly turned about the wok and then receive a sprinkling of water and dry sherry. The velveted shrimp are tossed into the mix. A simple sauce of soy sauce, dry sherry, sesame oil, and sugar is stirred together, poured on top, and incorporated. Amazingly, I completed all these steps without ruining the dish. In fact, I’m proud of what I accomplished here. 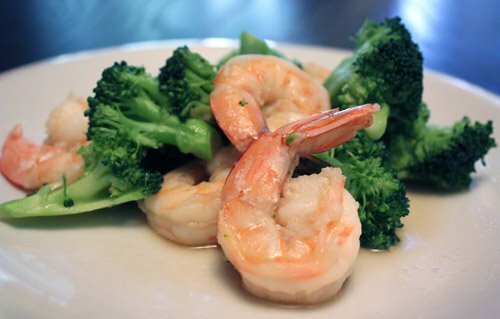 The broccoli flowerets absorbed the sauce to nice effect, and the overall mild flavors kept the focus on the shrimp. The tender shrimp had a smooth surface texture unlike any I had prepared before. I’m looking forward to velveting chicken and learning more as I continue through this book. This was a good first step on the path to my Chinese cooking being eagerly anticipated. Or, at least tolerated. This broccoli rabe pesto is from the October issue of Food and Wine. All types of pesto, chipotle pesto with grilled chicken, cilantro and almond pesto on pizza, arugula and walnut pesto with whole wheat pasta, and traditional basil pesto, have found their way into my kitchen. So, when I read about this variation that was new to me, I had to try it. 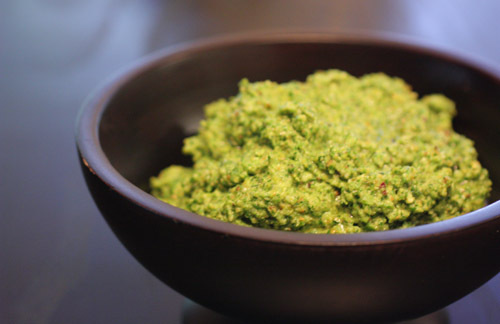 Broccoli rabe is pureed with pistachios, garlic, parsley, pecorino, and olive oil. It formed a thick spread which was mounded on crostini. I had some ricotta on hand, so some of the crostini were layered with it and then the pesto. The broccoli rabe and pistachios were delicious together, and garlic and pecorino were, of course, excellent accompaniments. This made a perfect, simple lunch. More crostini and pesto were also very good with salad for dinner the next day, and there was still some pesto remaining after that. A cup or so was packed into the freezer, and it’s targeted for a pasta meal in the not too distant future. For the pasta, I’m guessing this somewhat dense pesto will need pasta cooking water and more olive oil to thin it a bit. I’m already thinking of the savory pureed vegetable and nuts, with a little sharpness of garlic and pecorino, enveloping some linguine. I can’t wait to use the rest of this pesto. Decadent items like Mushrooms and Leeks with Pecorino Fonduta and Smore Brownies find their way onto my plate often enough, but I do try to stick to healthy options most of the time. Tofu oven fries are good; they really are. And, I really am a big fan of broccoli. Last Saturday, I wanted to bake something for breakfast, but I wanted a healthy option. 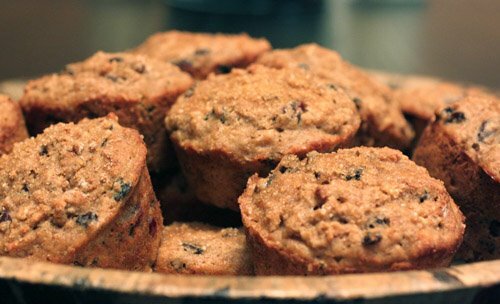 When I’m feeling like upping the whole grains, limiting the saturated fats, and getting plenty of antioxidants, I turn to The Mayo Clinic Williams-Sonoma Cookbook which is where I found these Cranberry Currant Oat Muffins. They’re made with whole wheat flour, oats, buttermilk, two little tablespoons of canola oil, one whole egg and one egg white, brown sugar, and nutmeg. 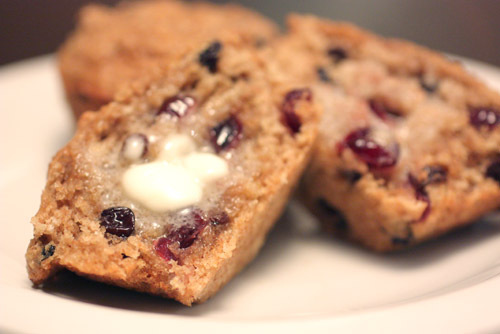 One cup each of dried cranberries and currants is used, and all that dried fruit keeps the muffins very moist. Just before they go in the oven, each muffin is topped with cinnamon sugar. I used turbinado sugar in the topping which added a little crunch. Freshly grated nutmeg in the batter makes the muffins deliciously fragrant. In fact, the nutmeg is the secret to these muffins’ success in my opinion. The warm spice flavor mingles with the nuttiness of the whole wheat and oats and delivers all the goodness you expect based on the aroma. When Kurt tried them, he requested them warm from the oven every day. They were great for breakfast and equally enjoyable for dessert last night. I've made fresh pasta a few times in the past, but I had never made a version with a vegetable incorporated into the dough. 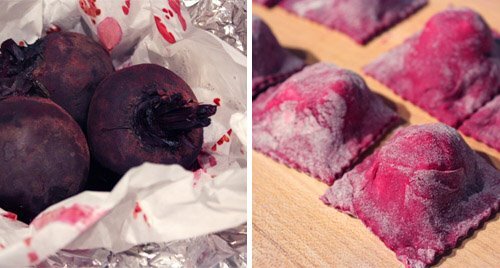 The fresh beet pasta dough and ravioli appeared in Living magazine in May of last year, and yesterday, I decided I was up for the challenge. I can't imagine making carrot, red pepper, spinach, and beet pasta all at once as Martha did, but making just one is doable. First, a note about the ricotta: The last time I needed a good, fresh ricotta, I was a little lazy and didn't plan ahead. This time, I thought to stop by Mandola's Italian Market which is only a few blocks from home. They no longer make fresh ricotta daily, but they will make it for you with 24 hours notice. I picked it up on Sunday morning, and it had just been made and was still warm. The chef screwed up and packed two pounds instead of one, so I was given an extra pound of fresh ricotta because it was my lucky day. Our Sunday breakfast included a treat of some still warm, very fresh ricotta on multi-grain bread, and after making the ravioli, there’s still some left for another use. For the pasta dough, I roasted some beets, peeled them, and pureed them with eggs and flour to form the dough. When it came together in the food processor, I turned the pretty, purple play-doh out onto a board and kneaded it with more flour. I wrapped it and let it rest for awhile. Then, I clamped down my pasta machine, and divided the dough. As I started the best part of pasta making which is cranking the dough through the machine, I realized there was a problem. I immediately had a sticky, purple mess all over the rollers and every surface of the machine. The machine was unclamped, wiped down, put back in the box, and I rolled by hand. I ended up dusting with a lot of flour to roll the dough with a pin, and it took a little extra time, but it worked. The filling included the very fresh ricotta, goat cheese, chives, and parsley. I opted to omit the mint. 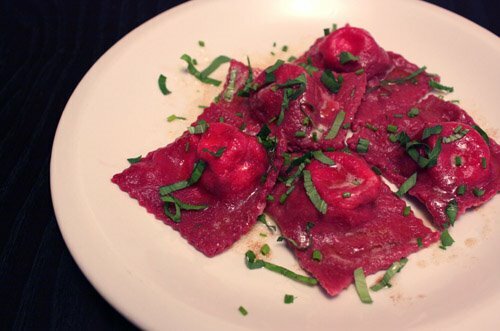 The pasta sheets were topped with dollops of filling, folded to enclose, and cut to shape. 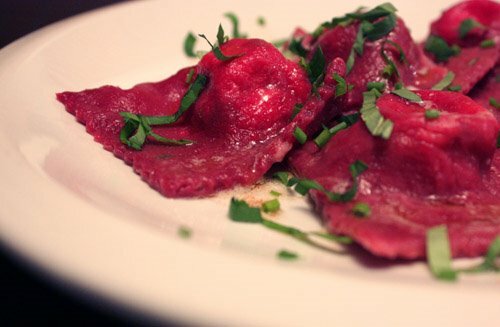 The ravioli were quickly boiled, drizzled with browned butter, and topped with some chopped chives, basil, and parsley. I have to admit, I was so taken with the color, I wasn't thinking too much about how it would taste. The look of the stuffed ravioli made me forgive the dough for being sticky and obstinate, and somehow, my brain was stuck in visual mode. I was so happy with how it looked, I had placed the ravioli on a plate before even having a taste. When I realized my slip, feeling kind of stupid, I had a bite and discovered, oh yeah, this tastes great too. I kind of knew it would be good, but that first bite took me by surprise because it was even better than I imagined. The chives and parsley in the cheese mixture did their appropriate herbal thing, and of course the cheeses were excellent. And, browned butter never hurts. 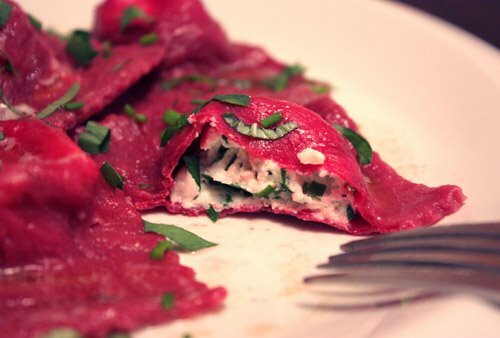 With the cheese filling, butter, and herbs, the beet flavor of the pasta was barely noticeable. But, when tasting a bit of pasta with no cheese, a subtle beet earthiness was there. It was definitely worth the trouble because the ravioli were even more delicious than they were pretty. This is another item from the September Saveur and is based on a recipe by Nick Malgieri. I was intrigued by the thought of a thick, pudding-like dessert made with just pureed fruit, sugar, and cornstarch. And, I wanted to have one more watermelon before summer is gone. However, I approached this as an experiment. I wasn’t sure I would like it. 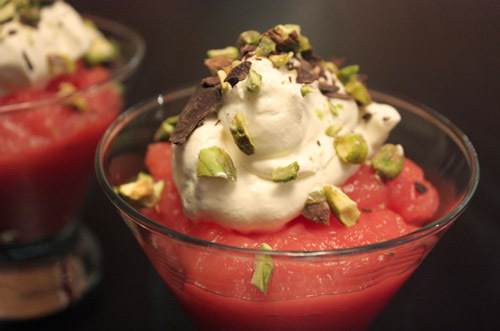 I don’t think I’ve ever not enjoyed a Sicilian dish, but watermelon pudding could have gone either way for me. I like big chunks of watermelon, and I like that they’re juicy and light and crunchy. I also like pureed watermelon with a little lime juice and vodka. But, the thought of taking watermelon and turning it into a thick, smooth substance made me curious. I used a small, very sweet, seedless watermelon; so I reduced the suggested amount of sugar by almost half. The watermelon, sugar, and cornstarch combination was passed through a sieve once thickened, so the little, white seeds were removed, and the resulting texture was completely smooth. 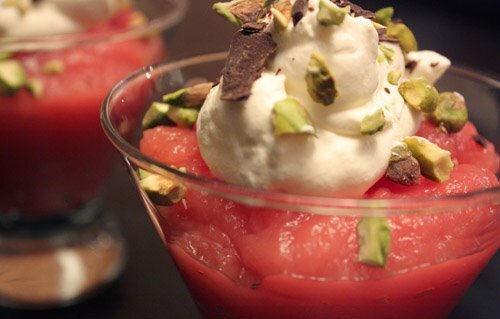 This was very much like pudding, but it was also very light with the watermelon flavor at the forefront. The gilding of pistachios, grated chocolate, and whipped cream provided textural contrast and a little decadence. And, the bright, pink color was delightful. I guess it is ok for watermelon to be something other than juicy, crunchy chunks or a vehicle for vodka. Now, I’m thinking of other fruit purees to turn into puddings, and mango could be up next. The other day, I happened upon some eggplants at the farmers’ market. There were three different varieties all sitting next to each other looking quite fetching. The grower told me that the lighter colored ones were milder in flavor. I couldn’t decide between dark purple, light purple, and striped, so I bought some of each. 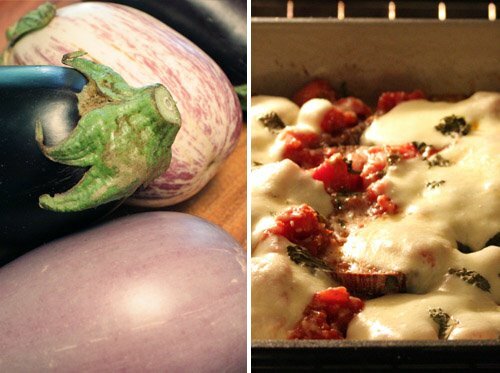 My plan was to make a big pan of eggplant parmesan, and I turned to the authority on Italian cuisine, Marcella Hazan, for a recipe. There was an article about her and her husband in the New York Times last week, and a book of her memoirs, Amarcord: Marcella Remembers , will be available in October. I’m looking forward to reading it. 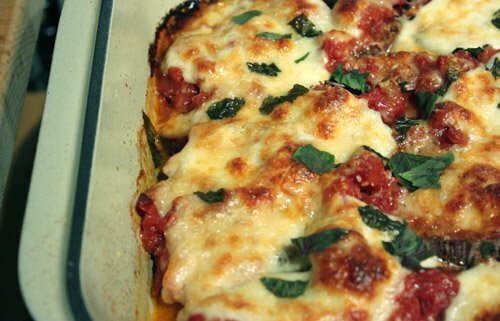 In Essentials of Classic Italian Cooking , she wrote that eggplant parmesan, although often thought to be an Italian-American creation, is in fact made in many Italian homes. She describes the process of steeping slices of eggplant with salt and draining them in a colander. Once pressed dry, the slices are dredged in just flour and fried. Her sauce is a very simple one with tomato and basil. The fried eggplant, tomato sauce, fresh mozzarella, and an excellent, grated parmigiana reggiano are layered in a pan and then baked. I had become accustomed to seeing eggplant slices dredged with flour, dipped in egg, then coated with breadcrumbs and fried for eggplant parmesan. That’s a delicious way to bread and fry just about anything. So, I thought a mere walk through flour might be lacking somehow. Actually, it was perfect. The eggplant tasted like eggplant, which is admittedly not a bold flavor, but it was clearer than it would have been with a heavier breading. The simple tomato sauce with fresh basil was also just right. I didn’t measure the cheese very carefully and probably used more than I was supposed to, but I’m like that with cheese. In the end, it was easily the best eggplant parmesan I have tasted. So, once again, simpler was better and trusting an expert like Marcella Hazan is always a good idea. 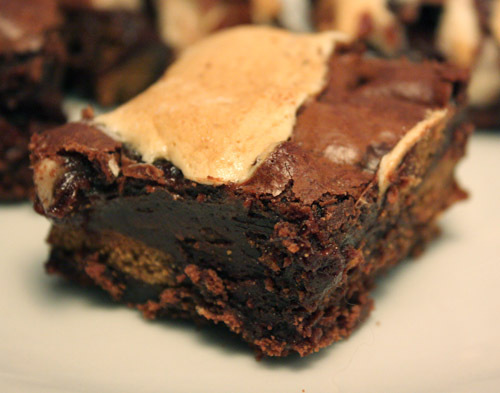 These unbelievable brownies come from Demolition Desserts by Elizabeth Falkner. Falkner states that she approaches dessert as an art form. Indeed. By taking familiar tastes and reconfiguring them, she creates unique, ingenious, edible works. The book displays many of her plated desserts from Citizen Cake in San Francisco and a few simpler offerings as well. It includes explanations about the desserts and how they were invented, suggestions for simplifying each one, and of course, beautiful photography. It also offers ingredient amounts by weight as well as by volume. 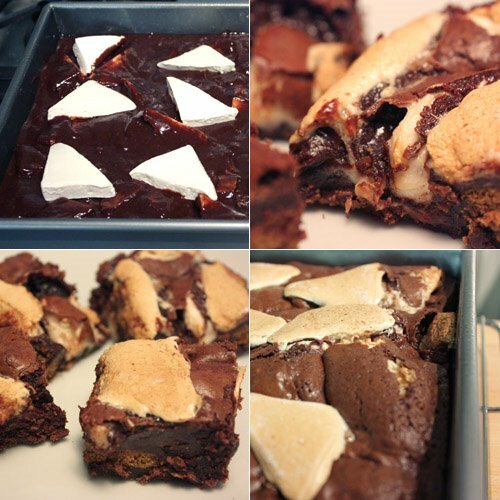 The Smore Brownies are made with homemade marshmallows, homemade graham crackers, and chunks of chocolate mixed into a rich brownie batter. I prepared the marshmallows and graham crackers on Saturday and baked the brownies on Sunday so as to spread out the tasks involved. 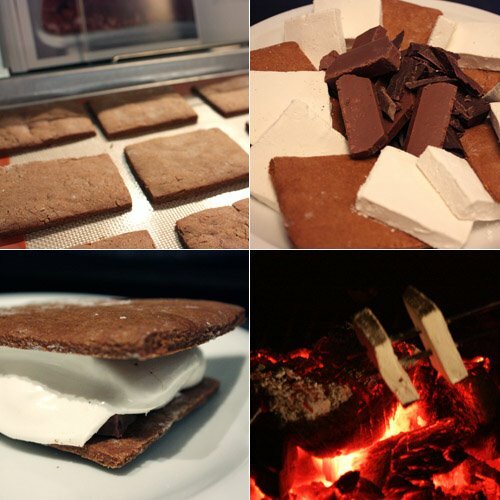 I had used her recipe for homemade marshmallows before, and they are too delicious for words. Homemade graham crackers are also so far beyond the manufactured type it’s difficult to explain. So, we found ourselves on Saturday night with these marshmallows, graham crackers, and some really good chocolate. By happy coincidence, we had used our grill on Saturday and there were hot coals just outside our door. What were we to do with this situation? I only wish my nieces could have visited as they are smores connoisseurs, and these were possibly the best ever smooshed together. For the brownies, I used a 60% Callebaut chocolate which was melted and mixed into the batter and an El Rey milk chocolate that was added as chunks. I made the marshmallows a little thin this time and cut them into triangles. For the graham crackers, I broke them into small pieces to be folded into the mixture. 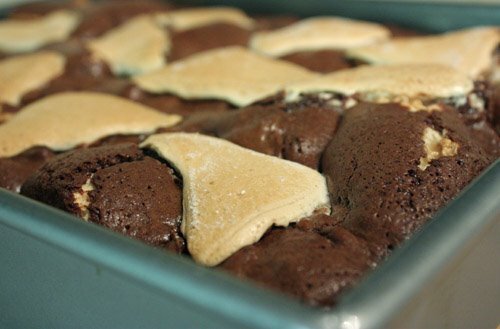 As it bakes, the brownies puff up nicely and form a crackly top. I learned that chilling them before cutting is a good idea. The soft inner texture with the gooey marshmallows makes cutting a little challenging, but once chilled it’s much easier. As usual, I brought the brownies to work this morning. I think they disappeared in under five minutes. It is a very rich brownie, and it’s completely irresistible. I cook a lot of zucchini. I like it. It’s versatile and abundant. 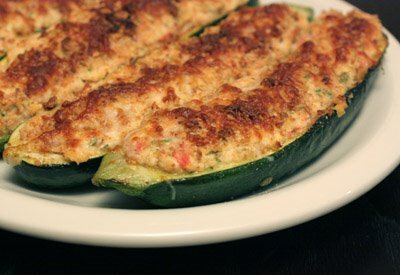 I’ve tried stuffed zucchini a few different ways over the years but have never found a stuffing I would repeat until now. This zucchine ripiene comes from the article about Calabrian ricotta in the September issue of Saveur. Sadly, I was not able to obtain Calabrian ricotta. I didn’t make my own ricotta either. And, Central Market had no fresh ricotta ready and waiting when I needed it although they sometimes stock it. I should have planned ahead and tried a little harder to locate some, but I settled for packaged ricotta made from part skim milk and cream. It was good as far as packaged ones go and had no stabilizers or preservatives. Once you have the best ricotta you can get, the next most important thing is to properly pre-cook the zucchini. The instructions suggest broiling them for five minutes. My oven was in use while I was prepping everything for this dish, so I cooked the zucchini on top of the stove in the sauté pan used for the onion, garlic, and tomatoes. You want to be sure the zucchini are cooked to the desired level before stuffing them because they really won’t cook much further once placed under the broiler for the final browning. This stuffing of ricotta, pecorino, tomatoes, onion, garlic, parsley, and oregano was a summery delight. Mint is also included in the stuffing. I used a small amount of fresh mint from my herb garden rather than dried, but it was a little out of place for me. Next time, I’ll leave it out and maybe garnish with fresh basil instead. 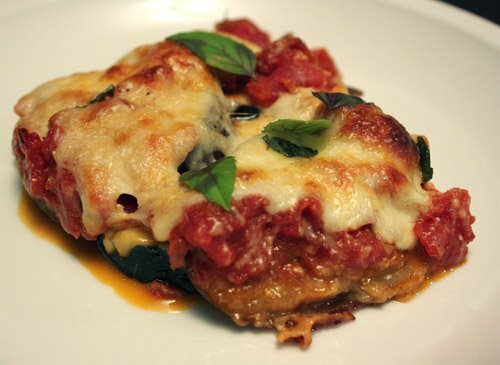 Depending on the size of the zucchini you use, one stuffed half can be a meal all by itself. 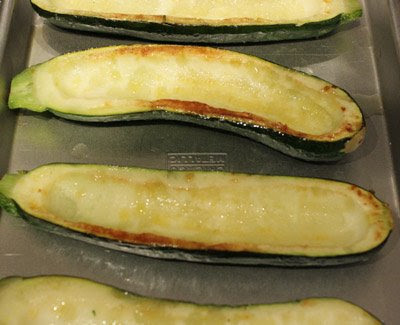 Or, since the stuffing holds up well, the zucchini halves could be cut into smaller pieces just before serving. I’d love to try this again with really fresh, possibly homemade, ricotta. 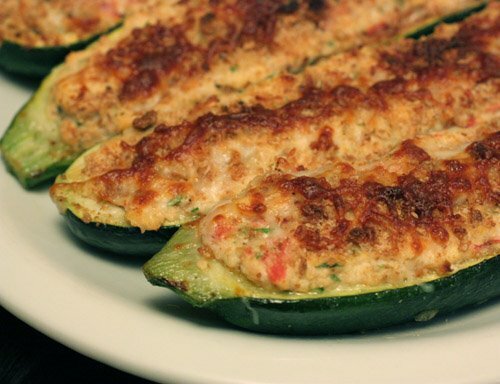 But, even with the packaged variety, this was my favorite stuffed zucchini to date. For the last few days, all our meals have included magazine recipes. My stack of cut-out pages actually got a little shorter for a change. 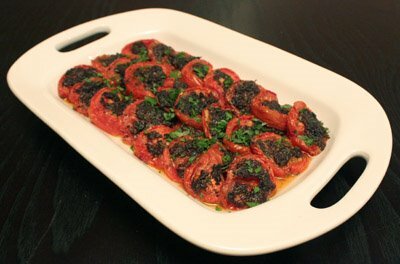 The first item I have to mention is the slow-roasted tomatoes from the March 2008 issue of Food and Wine. There’s a note about how less than perfect tomatoes can be used for this, and it will still be very good. So, of course, it’s fantastic when the tomatoes are perfect. Thick slices of tomatoes are topped with a nicoise olive, basil, rosemary, and olive oil paste. Then, they are roasted at a low temperature for one and a half hours. 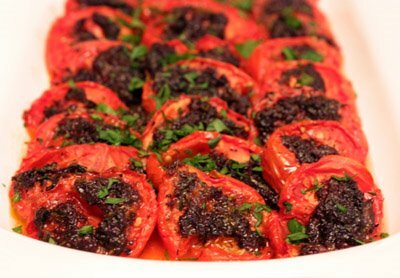 To understand this dish, imagine the best flavor aspects of tomatoes and olives with the volume turned up, so to speak, about 20 times. The intensity of the tomatoes’ sweetness accompanied by the olives’ brininess was really amazing. 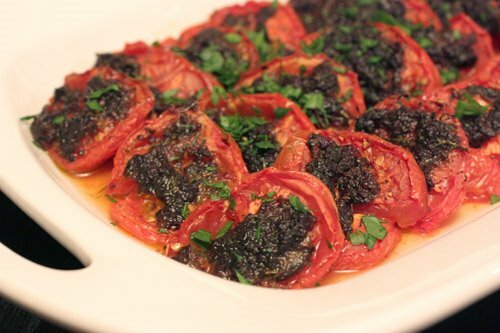 The tomatoes retain a bit of texture but become more tender and delicate after roasting. I realized I was being cautious as I scooped up each slice so as not to spill any of the ethereal olive oil-tomato liquid that pooled around the platter. I didn’t want to waste any of it. There were other items included in this meal, but I can’t remember what they were. Grilled chicken, maybe? Nothing else mattered once I tasted these tomatoes. Mushrooms and cheese are a pretty perfect pairing for me. I'm very fond of both. But, there was more than that to the pairing concept here. In the April issue of Food and Wine, Shea Gallante of Manhattan's Cru suggested wine pairings for several of his dishes. All of them were extremely tempting, especially the pizza with charred cherry tomatoes and pesto, but I chose to first try the mushrooms and leeks with pecorino fonduta. The wine pairing for this was a Montepulciano d’Abruzzo because its tannins would make this cream- and cheese-filled indulgence seem lighter. The intro to the recipe states: "Gallante makes this dish at Cru with morels that are poached in butter then topped with pecorino fonduta, Italy's fondue." Well, knock me over with butter-poached morels. If only it was April and I was in Illinois where my uncle used to give us bags full of hand-harvested wild morels. They may be the most delicious mushroom there is, but I don’t think I've met a mushroom I didn’t like. Since it's September and the Austin Farmers' Market is the best I can do right now, I chose some locally grown, beautiful, oyster mushrooms. They were added to sauteed leeks and garlic and cooked until the liquid was evaporated, and chopped rosemary was added. I always thought thyme was my favorite herb with mushrooms, but I may change my mind because rosemary was just right on this occasion. 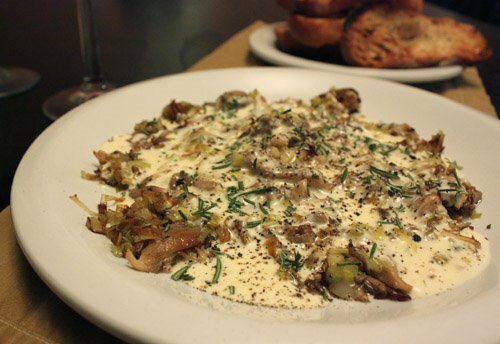 The mushrooms and leeks received a tiny drizzle of balsamic vinegar and then a rich, luxurious bathing in pecorino and parmigiana cream fonduta. 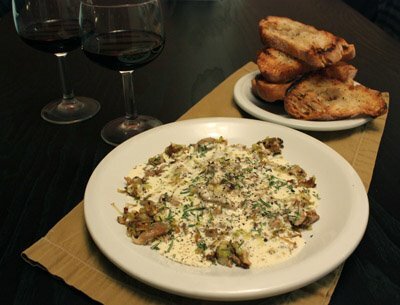 Grilled bread, this delicious fonduta-covered melange, and a good Italian, tannic red wine. I don't think I even have to describe how good that was. The wine did cut the richness of the dish, and its earthiness was very nice with the mushrooms and the rosemary. The combinations here, oyster mushrooms, pecorino and parmigiana cheeses, rosemary, and the Montepulciano d'Abruzzo, were well-matched all around. This will definitely appear on our table many times over in the coming months and beyond. It’s hatch chile season, and that’s a great time of year. The hot and mild green chiles arrive in Austin direct from Hatch, New Mexico and much to my delight. I had an idea about cooking up a whole lot of red beans with freshly roasted hatch chiles and then using the beans a couple of different ways. 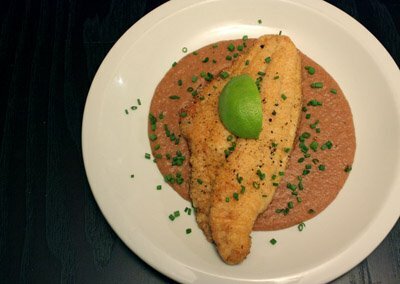 The first meal was cornmeal crusted catfish with silky red bean puree. I previously wrote about the amazing food found in Susan Spicer’s Crescent City Cooking , and this meal is included in the book. 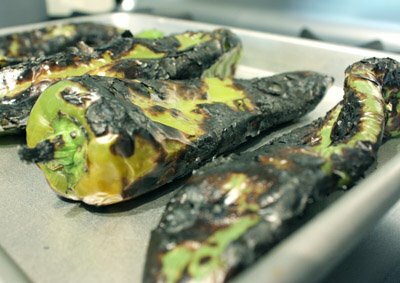 I chose a combination of hot and mild hatch chiles, roasted them on the stovetop, peeled off the char, and seeded and chopped them. The red beans soaked overnight and then were simmered with just water for a few hours. Once the beans were cooked, I set about adding all the flavor-packed items. If I had followed Spicer’s instructions exactly, chipotle and poblano were supposed to be added to the beans along with garlic, onion, tomato puree, chile powder, and bay leaves or bouquet garni. I used hatch chiles instead of the chipotle and poblano. After cooking with the added ingredients and becoming delicious, some of the beans were pureed in a blender with some cooking liquid and lime juice. Because the starchiness of the beans seems to absorb a lot of flavor and heat, the puree can be seasoned aggressively. I repeatedly tasted the beans and then the puree and continued to adjust the seasoning as I went. In the end, I think I should have included the chipotles too. Hatch chiles offer their own unique character, but the puree did lack that special, smoky quality that chipotles bring. The only slightly negative comment I can make is that, unfortunately, this puree is not the most photogenic food item. It looks a little like a pile of brown mud sitting under the catfish. But, regardless of its humble appearance, the flavor was fantastic. The smooth texture made it like a thick sauce, but one with none of the heaviness or guilt of butter or cream. 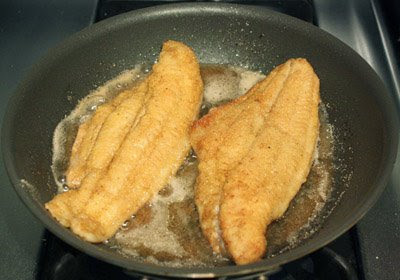 The catfish was dredged in a cornmeal and flour combination which was seasoned with cumin and coriander. It was fried quickly in butter and canola oil. The catfish fillets then rested atop the silky puree and received a sprinkling of chopped chives. 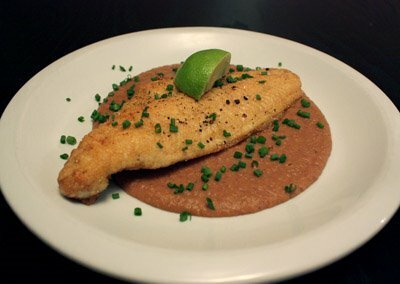 I was already a big fan of red beans, bean purees in general, and catfish, but this was a great meal. 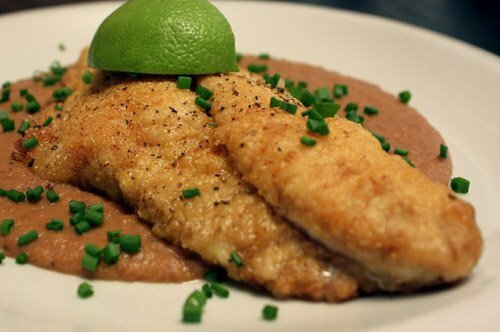 You really can’t go wrong with cornmeal crusted catfish, and served with this puree as sauce, the flavors are southwesternish by way of New Orleans. Interesting, bold flavors and hints of spice are delivered via contrasting textures. What happened with the rest of the red beans? The next day, we grilled hatch chile chicken sausages and served them with the amazing red beans and some cajun popcorn rice. I have a feeling Hatch chile season is going to seem too short this year. Sweets: Soul Food Desserts and Memories is a gem of a book. Anecdotes included throughout the book clearly convey the warmth, happiness, and fun shared among an extended family and their community. The author has written about the women in her family, what excellent cooks they were, and how well known they were for their sweets. These ladies took equal pride in the orderliness of their homes and the quality of their desserts. There are so many desserts that I wanted to make as soon as I read about them. The meringue topped banana pudding, the peach cobbler, and the strawberry layer cake are all on my short list. But, the first cake I had to have was the brown sugar pound cake. This cake came from the author’s maternal grandmother. I made just a couple of alterations to the ingredient list. I used all butter rather than a combination of butter and shortening, and I used AP flour since I didn’t have any cake flour on hand. 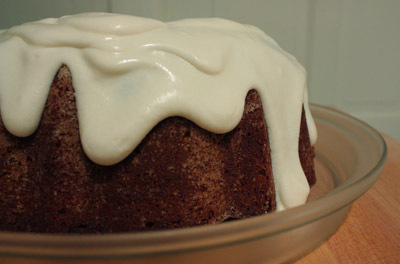 Then, for the frosting, I used natural maple syrup instead of maple extract. The flour and baking powder get sifted together three times. 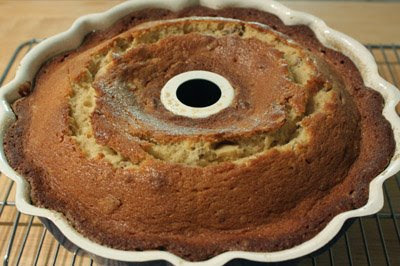 The sifting process along with the five eggs in the recipe, ensure an amazing texture for this cake. It was impossible for it to be anything but fantastic, and well, it was just that. As Kurt and I tasted our first pieces of the cake, we both just nodded in agreement. Wow. 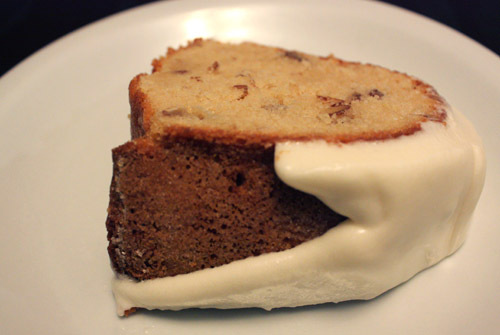 It was a buttery, brown sugary, pecan-filled, just really, really good pound cake with cream cheese, maple frosting. 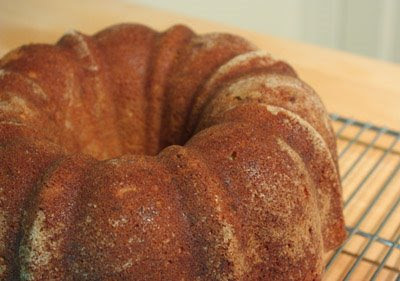 Read this book if you get a chance, and try this brown sugar pound cake. I can very highly recommend both.